Resigning from your current job, disappearing into despair or placing the blame with your employer instead of looking at what you could do to anticipate and respond to unexpected or unwanted stressors at work can be soul destroying. It has been written in collaboration with a team of academic and peer reviewers from around the world, including leading resilience experts to ensure that the final product has a strong theoretical grounding, with a very easy to apply approach. The unique coaching style of this book allows readers to truly personalise the approach they choose to take; using the stories, the frameworks and the research to create their own voyage. 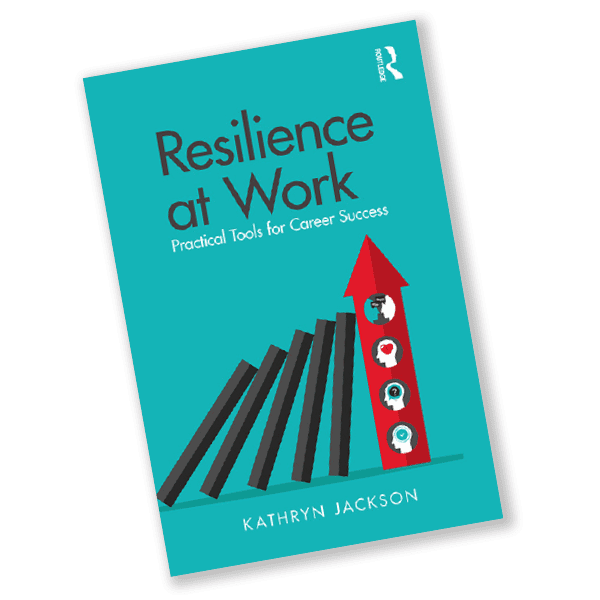 To purchase your copy please either visit your favourite local bookstore and ask if they currently stock Resilience at Work or click your preferred link below. Please contact Routledge directly for bulk orders or specialised copies. For Bulk Book orders (25+) please contact Routledge direct. This is an ideal text for organizations who want to support employees in becoming more resilient, by giving them the tools for self-managed resilience at work. It is also useful for career coaches, counsellors and other professionals who are working with clients facing their own crisis of resilience, as well as students entering the workforce to begin uncertain career journeys. Human Resources or Learning & Development practitioners who are looking for a resource to support increased resilience in their teams at work. The book will provide a shared language, a road map for implementing resilience programmes and conversation guides for leaders supporting their teams. Ambitious employees who know what they want at work and intend to achieve their career aspirations regardless of what happens around them. The book asks the questions they need to consider, introduces tools and resources to support them and shares stories of people who have faced similar circumstances. Coaches, Counsellors and other professionals working with clients who are focused on achieving career goals or are facing a crisis of resilience at work which influences their wider wellbeing. The book provides a blueprint of the latest research to support conversations and wider resources to explore together. Students who are entering the workforce and want to learn the tools and resources of achieving their ambitions from the very outset of their journey instead of waiting until they are further into their career to learn the lessons of resilience at work.